Heritage is used for a variety of contemporary needs and circumstances. As we know from Critical Heritage Studies, heritage is used in legitimizing and underwriting particular claims from particular groups about who gets to speak for and about the past, and to what end. Heritage is also a major part of education, of identity creation and maintenance, and of nationalism. We also know that heritage is used in tourism development, particularly in building, growing, and diversifying the attraction mix at a particular tourism location or destination. Similarly, we know that heritage is something tourists seek when on vacation; that many – if not most – leisure tourists encounter heritage at some point during their trip. We also know that heritage is vital in terms of urban planning, that heritage areas and districts can be good for attracting and retaining businesses and people to a city, and that built heritage can provide diverse and interesting architectural styles to communities. What has been relatively late to come, though is picking up tremendous steam, is linking heritage – and, for our purposes, sport heritage – to health and health care issues. 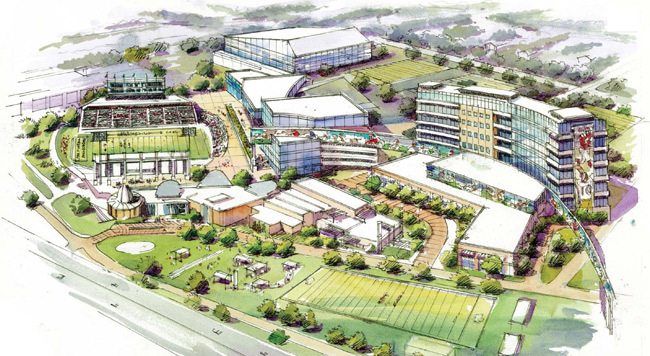 The concept is one that’s been floating around with some league leaders for some time: a central place for medical and physical assistance for needy players, and housing for former players who need a hand. With the Hall of Fame running more and more educational programs for local schools—and research projects on the history of the game and future health of the game and its players—imagine the benefit of having scores of former players on campus as resource people. I’m told that the type of facility the Hall wants would cost around $75 million and serve upwards of 500 players a year. With brain trauma and other long-term health issues so prevalent, it’s past time the league’s owners follow Benson’s lead and help fund a facility where, as Benson says, the legends can land. From a sport heritage perspective, this development offers some interesting pieces. Firstly, it positions the Hall of Fame as a multi-use facility beyond its touristic/events purpose. Secondly, it posits the “legends” that live at a facility as a kind-of heritage resource, a kind-of “living sport heritage.” Finally, and perhaps most importantly, by placing this facility at the Hall of Fame, it somewhat acknowledges that the sport has some negative legacies – including the the long term health impacts of playing a violent sport. It is a very interesting development, one that deserves some investigation. Sport heritage and the sporting past are also being used in healthcare, to great fanfare and success, by the Sporting Memories Network in the UK. The Network was “established to promote and develop the use of sporting memories to improve the well-being of older people and to help tackle dementia, depression and social isolation.” The Network uses something called Reminiscence Therapy, though as strange as it seems, they mention that sport was rarely used in this kind of therapy. Furthermore, in speaking with some of my Recreational Therapy colleagues, men are often overlooked in Reminiscence Therapy programs, so sport heritage offers a very strong emotional vehicle to serve an underserved group. I suppose the point is that, perhaps, we in sport heritage have to consider a wider utility for the sporting past. This is not to suggest that we abandon our critical heritage work, or that there isn’t room for sport heritage in education, tourism development, urban planning, and conservation. Rather, perhaps we ought to consider more how sport heritage might be employed in tackling broader issues such as health and wellbeing. By Gregory Ramshaw in Uncategorized on November 24, 2014 .